Here is my next project! This was my husband's grandmother's dresser. It is finding a new home in my daughter's room. 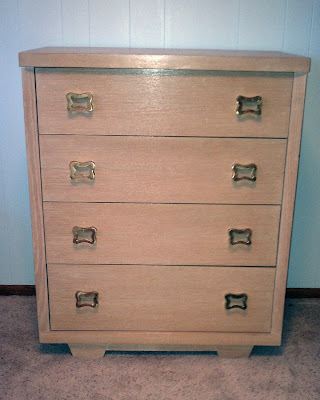 I love the clean lines of this piece and it is so functional, boasting huge deep drawers! While I don't mind the natural blonde finish I want to make it a bit more fun and colorful. But now what to do, what to do....so many options! Stay tuned. I can hardly wait to see what you come up with. She could have Great Grandma Gwen's sewing machine desk and chair to match the 1950's blonde wood.